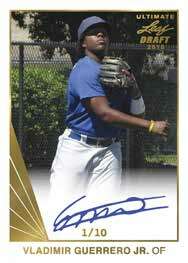 Following a break of several years, 2018 Leaf Ultimate Draft Baseball marks the return of the prospect product. Each box of the all-autograph set has six signed cards. 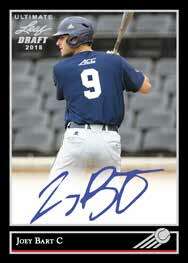 Featuring only autographs, 2018 Leaf Ultimate Draft Baseball appears to follow the same format as the football version. As such, the 2018 Leaf Ultimate Draft Baseball checklist honors past designs via 1990 Leaf Autograph, 1991 Leaf Rookie Autograph and 1992 Leaf Black Gold Autograph tribute cards. Each line also features a variety of low-numbered parallels. While top MLB prospects and 2018 draftees make up the majority of the young stars featured, several of these top players have already gotten the call to the big leagues. Last issued in 2015, the 2018 release has overall production of just 200 cases (2,400 boxes). Buy 2018 Leaf Ultimate Baseball autographs on eBay. PARALLEL CARDS: Gold #/25, Silver Prismatic #/15, Gold Prismatic #/10, Red #/5, Purple 1/1. View the 2018 Leaf Ultimate Draft Baseball checklist spreadsheet. Now these are some good-looking cards. Love the different styles of borders on them. Some great autos as well. Leaf never disappoints. High quality and super loaded checklist. Every box has at least one pretty big hit if not more. 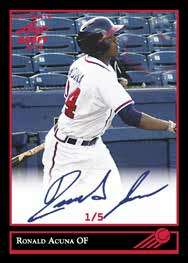 Beautiful clean and crisp on-card autos on classic designs, very well done Leaf.